The online CCG Spellstone includes the ability “invisibility,” which makes enemy skills miss. In addition to using it for assassins and illusionists, the game applies the same skill to represent carapaces that make attacks deflect, like turtles. 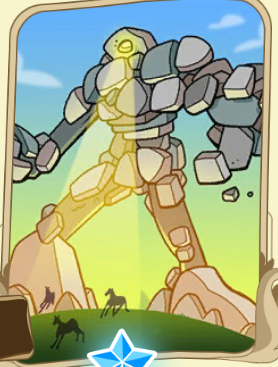 This leads to the pictured Rock Titan, a huge pile of stone whose toes tower over horses, with a giant spotlight for its eye, which is very sneaky.